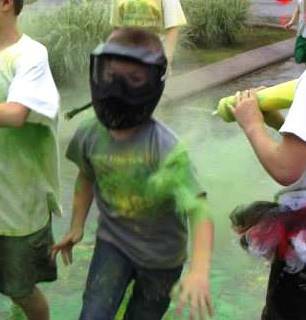 Color My Party™: Is Colored Powder OK for People With Asthma? Is Colored Powder OK for People With Asthma? We haven't heard of any issues from any of our customers or at any of the events that we have helped with. To be safe though, we would recommend anyone that has asthma to take precautions, be smart about their decision, and use their best judgment. We have seen several folks wear bandannas and dust masks, even racing helmets. Not sure if they wore those because they actually had asthma or if they just didn't want to get the colored cornstarch powder in their mouths.